We come from a culture, where tea is everything. In Russia, tea is probably the most commonly consumed beverage. It’s like water, but much more popular than water. Everyone drinks it – adults, kids, and even coffee lovers. It’s acceptable to have tea after every meal, as well as as during breaks throughout the day, any time of day. If you attempt to stop by someone’s house for a quick second, you will most likely end up staying for tea. And tea time is sacred. It’s when 90% of conversations happen (or at least it seems that way). Tea time is never just tea, either, there’s always some kind of treat involved. It can really be anything sweet: hard candy, chocolate, cookies, waffles, cake, powdered sugar-dusted cranberries… Dessert is so intertwined with tea for us, that to this day we can’t enjoy anything sweet without a hot beverage. It just doesn’t taste good. We’d rather have no dessert than dessert without tea. This is especially true for cookies. 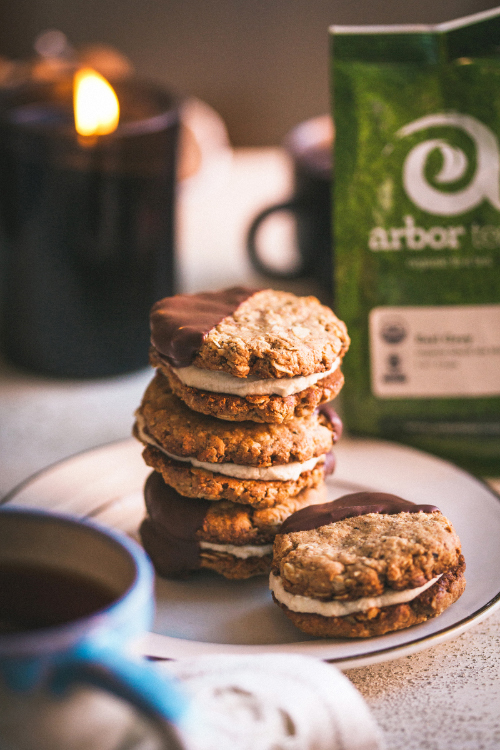 Today we are super excited to be collaborating on a tea time-ready, sandwich cookie recipe with Arbor Teas, a Michigan-based tea company that carries the loveliest selection of organic and fair-trade loose leaf tea. When we were dreaming up these cookies, we immediately thought about tea sandwiches – you know, those miniature, crustless sandwiches that usually accompany fancy tea. With that format in mind, we went for a layered ‘sandwich’ cookie. Earl Grey tea is probably our favorite, most nostalgia-inducing black tea, and since the Arbor Teas Earl Grey smelled so incredibly fresh (the best we’ve ever had! ), we were very excited to incorporate that flavor in some way. The result: buttery, vegan and gluten-free cookies, layered with a luxurious Earl Grey cream, with a kiss of dark chocolate. They are the perfect cross between virtuous and indulgent. And of course, they are best enjoyed with or dipped in tea. Arbor Teas is one of those dream sponsors that we feel lucky to work with. Not only do they take pride in the quality of their product, but they also put a huge emphasis on sustainability. They source only organic and fair-trade tea, package it in backyard-compostable packaging, and run their facility on solar power. We like to believe that companies like this are the future. Besides their earl grey, we’ve been loving the Chaga Chicory, Makaibari Estate Silver Tips, and Golden Ginger Turmeric teas. Place the cashews, arrowroot, tea, lemon juice, maple syrup, and coconut oil in an upright blender. Blend until smooth. Place the coconut fat in a medium bowl and whisk it with a whisk to make it a little fluffier. Add the blended mixture to the bowl and whisk it in. Place the bowl in the refrigerator for about 1 hour, until the cream is hardened but scoopable. You will likely have some cream left over after making the cookies. You can freeze it and use it as cupcake/cake icing, serve on the side of pancakes, waffles, crepes, etc. Place the dates into a small, heat proof bowl and pour hot purified water over them, then leave to soak for 10 minutes. Place the flax/chia meal into another small bowl and add 6 tablespoons of purified water. Whisk to combine and let sit to gel for 15 minutes. Preheat oven to 350° F (180° C). Combine the oats, flour or meal, baking powder, baking soda, Earl Grey powder (if using), and salt in a large bowl, mix well. Combine the nut butter, ¼ cup of coconut oil, drained soaked dates and the gelled flax/chia in a bowl of a food processor fit with an S blade. Process until smooth. Add the mixture into the bowl with the oats and flours, and stir to combine. The mixture will be stiff and sticky. Prepare a baking sheet by covering it with parchment paper. Use a small ice cream scoop to scoop uniform batter portions onto the baking sheet. If you don't have an ice cream scoop, portion out about 2 tablespoons of batter for each cookie. Leave enough space between each portion for flattening. Using a lightly oiled hand, flatten each cookie into uniform circles, about ¼" in thickness. Bake for 10-12 minutes, or until the outside of the cookies is dry to the touch. Let the cookies cool for about 5-7 minutes on the baking sheet, then transfer to a cooling rack to cool completely. You will probably need to bake the cookies in 2 batches. To make the cookie sandwiches, place a generous amount of the Earl Grey cream into the center of a cookie, then use another cookie to sandwich the cream and let it spread out to the sides, pressing gently. The cookies should be facing bottom side in. Repeat with the rest of the cookies, placing them back on their baking sheet. Place in the refrigerator while you prepare the chocolate, for the Earl Grey cream to harden a little. Prepare a drying rack, lined with parchment paper underneath. Melt the chocolate chips in a small saucepan or bowl on a double boiler, together with the remaining 1 tablespoon of coconut oil. Dip each cookie into the melted chocolate about half way, letting the excess chocolate drip off. Place on the drying rack. Repeat with the rest of the cookies. Transfer the rack to the refrigerator for a few minutes for the chocolate to harden. Keep the cookies in an airtight container in the refrigerator or a cool room. Enjoy!